Pascal Gross insists Albion will keep their feet on the ground after a ‘massive’ victory against Arsenal on Sunday. 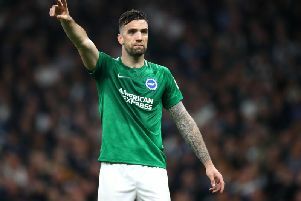 German playmaker Gross continued his outstanding form as his corner led to Lewis Dunk’s opening goal and then he crossed for Glenn Murray to head home the second. Gross now has eight assists to go with his five goals this season and he was last week nominated for the Premier League EA Sports and PFA February player of the month awards. While delighted with the win against Arsenal, Gross says Albion haven’t achieved their goal of Premier League safety yet: “It’s a huge day and a massive win. “We had a good start and worked very hard. They have a lot of quality but we are very happy with the win. “They have had a tough time but still it’s a great club with amazing players. I don’t want to say our win is not that huge because they’re not in top form. “We have one goal, to stay up. Momentum is good, better than the other way round but we still have something to do. “We won’t stop until we achieve what we want. Gross was quick to praise his team-mates when asked about his own form and said: “I’m in good form. I’ve had many games at the moment where I assist goals or make the second-to-last pass.